Well , 5 days later I was able to make my way to the very spot where the air was at its coldest. Surely there would have to be lots of remnant ice and with lots of rain over the last 2 days, the water flow would be healthy. Sadly, I was wrong. In the southeastern US, the cold never lasts too long and temperatures were some 60-70 degrees warmer in just a few days. By the time I made it to Laurel Falls, all ice except a few small traces here and there, was gone. The “January Thaw” had already occurred and I was left only with a very healthy water flow. However, it was the best water flow that I have seen here. If you are thinking of hiking to Laurel Falls, know that there are 2 ways of doing this, that I know of anyway. Both start in the Hampton Tn area. The way that I have not been, begins on US 321. I have read that it is longer, and I have enjoyed the other way so much that I just haven’t found the motivation to try this way yet, maybe this year. The other way requires a wicked drive up Dennis Cove Road. This is a turn off of US 321 about a half mile away from the other trailhead. It is pretty much in the heart of the Hampton residential area. Follow this narrow road through the houses and soon, it goes up, way up. This is a very tricky, curvy road, with no guard rails. I am just glad to see it paved. Even so, take your time up this mountain. Driving this, it makes me wonder how steep the trail from the bottom of US 321 might be. After the long drive up, there is a short drive down , and then look for the Appalachian Trail Crossing. This is where the hike begins. The trail to Laurel Falls follow the Appalachian Trail entirely, and is a nice 1.3 miles. The first 0.6 miles is totally flat, very surprisingly. Apparently this was once a railroad for logging, so it makes a nice flat Appalachian Trail here. After this section, this first of 3 “passes” through steep rock walls appears. These passes are certainly man made and were most likely part of the railroad. After the first pass , the trail begins to go down. It leads down to the Laurel Fork to a one sided foot bridge that I think makes a beautiful scene. The pretty stream that you have been following the entire flat section is now picking up its pace as it heads into the rock wall lined gorge. The trail makes a fairly steep but manageable climb on the other side then flattens again somewhat. You will be way above the stream now as it is making lots of noise now. After 2 more passes , the trail comes to a split. The iconic Appalachian Trail, with its iconic white rectangular blazes, have an arrow to the left . It is also a double blaze signaling a turn in the trail I have learned. Another couple of trees down, there is a sign nailed to a tree that shows the High Water Trail straight, and Laurel Falls left. This is where the trail gets nasty. Going left, it follows down a steep, rock step assisted descent of nearly 1/4 of a mile, that had better be approached with caution. The steepness, and the uneven rocks could make for a nasty fall if not done slowly and carefully. 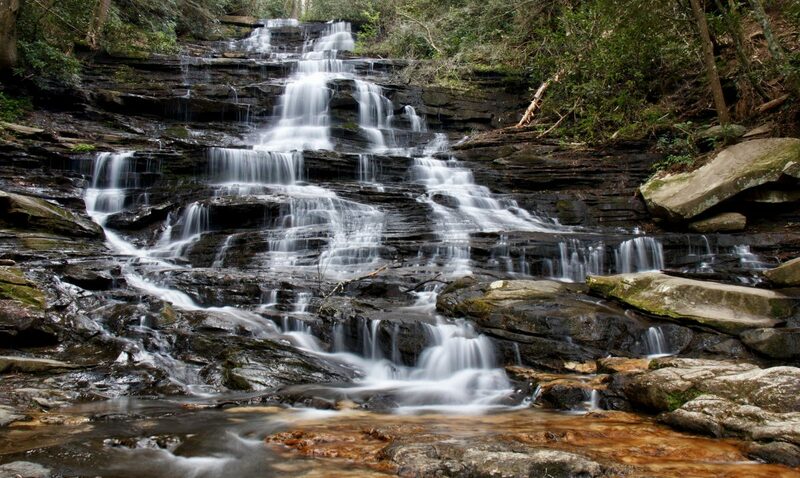 Once down, the beautifully 55 foot Laurel Falls is in wide view. As the wide creeks roars over the 55 foot cascade, it makes a sharp turn to the left as it continues its way to the Doe River way below. There are many places down here to hang out and take photos. I have not taken or even seen a picture that displays the true beauty and power of this waterfall that one will experience in person. I will keep trying though….lol. Enjoy your stay here, and rest up. If you thought the descent was tough, wait until you have to climb out of this deep hole. Once at the top, the huffing and puffing will soon subside as the flatter trail conditions take over. 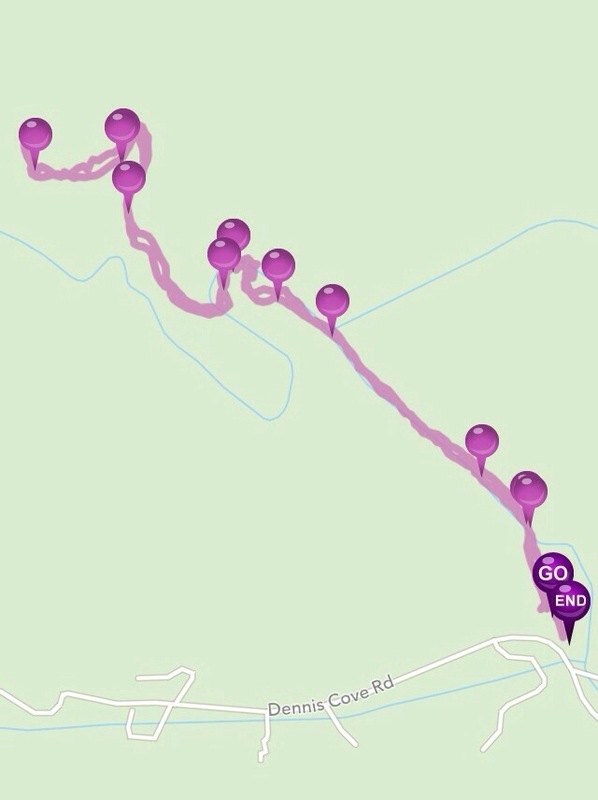 This is a 2.6 mile round trip hike along a beautiful trail. Plan this along with a few other waterfalls in the area for a fine outing. 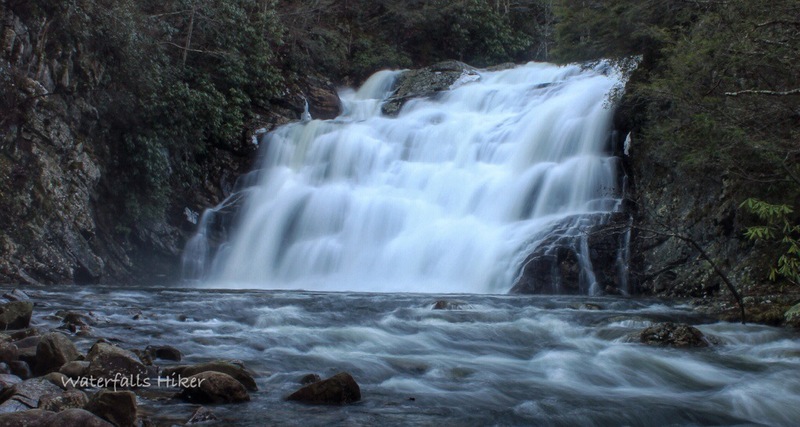 Dennis Cove Falls, Roan Mountain, Elk River Falls, Compression Falls, Trashcan Falls, Jones Falls and Watauga Lake are all close by! This is one of my favorite waterfalls! I like it a lot myself. That entire are is rich with nice waterfalls.